Google has launched new gadget for Google Desktop users. For starters, Google desktop is a download-able free software from Google to access and interface with various Google services from your desktop. 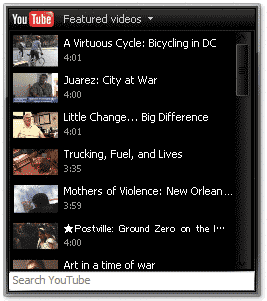 Youtube Gadget for Google desktop makes Youtube video viewing experience easy and comfortable. You can search for Youtube videos using search function in the gadget. Also, Youtube videos playÂ directly inside the gadget window (no more popping browser windows!). Gadget also show feedÂ of most popular videos of the day. Incase you are lost of what to watch, this Youtube Gadget gives you list of featured videos worth a watch. Download Youtube Gadget for your existing Google DesktopÂ and enjoy Youtube Videos on the desktop. Dovide (http://video.vertical-align.com) is web based application and desktop client to play and organize Youtube videos.